The Centre has been open for business since Monday 7th June 2010 and has been a complete success with both regular and occasional attendees visiting each week. Refer a Friend:- Encourage a friend to bring their dog for a full day visit to our Day Care Centre and receive a £5 discount off a full day visit for your own dog (subject to T&C’s and your dog passing the behavioural assessment). Multi Dog Discount:- Owners with two or more dogs receive a £1 discount per dog off the daily rate when both dogs attend together. 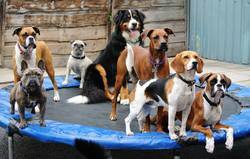 Salford Council Staff:- Owners will receive a £1 discount per dog off the daily rate. Your ID card must be shown to qualify (subject to T&C’s and your dog passing the behavioural assessment). Dogs that are left at home for long periods of time can find it very stressful and boring. Many dogs can become destructive or annoy the neighbours by howling and barking all day. Whether you are out at work, out for the day or just need some peace, your dog can benefit from a day at our Day Care Centre. 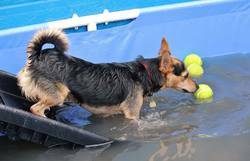 We have plenty of activities for your dog to get involved in. Providing the exercise and mental stimulation that your dogs need on a daily basis. Your dog also gets much needed company from their own kind. The dogs have free access to large indoor and outdoor play areas. We have a high ratio of staff to dogs. The dogs enjoy free running interaction with each other and their human carers. Our dog visitors dictate to us what their needs are. 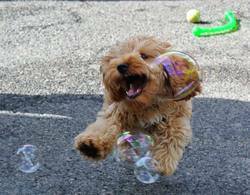 Having supervised fun with their own playmates or enjoying activities with their human carers. In addition to all the fun, lots of love and cuddles are included at no extra cost! The centre has a secure mezzanine area with additional games, toys and agility equipment. Access to the mezzanine is restricted to the dogs. Therefore the area and its toys become an additional fun activity each day. The centre is fully licensed by Salford Council and can accommodate up to 50 dogs at one time and will always have a suitable dog/person ratio to ensure your dog has the best possible day with us. The centre has comfy settees and dog beds allowing your dog to take a rest when it wants. We request owners provide some food for their dogs during the chill out period. This is to ensure their dogs do not become too hungry during their visit. We do not make additional charges to feed your dog. We prefer not to use a separate puppy area; over the years we have come to realise that segregated pups want to be out in the unit with the bigger dogs and can become stressed when being kept apart. Instead we issue the pups with their own minders. The staff are always happy to take their 30 minute slots of puppy minding. The puppy then learns to play with the other dogs, while their minder is on hand to 'slow down' any over-exuberant behaviour. When a puppy needs to sleep, it will enjoy one of the comfy beds in the office. After an initial chat with an owner regarding their dog's suitability to attend, a dog may be invited to visit the Centre for a short behavioural assessment. All dogs must be up to date with their vaccinations, worming and flea treatment. Owners should complete a Registration Form before attending day care, agree to our Terms and Conditions and produce their dog's vaccination certificate for checking. The Day Care Centre is situated on Missouri Avenue, Salford which is 1.4 miles away from the M602, 1.2 miles from Salford Quays and Media City and is perfect for anyone living or working in Salford area, Quays, Trafford Park or Manchester City Centre. If you would like to book a place, contact Karen directly to arrange your dogs behavioural assessment and pre-book your dog's Day Care. "Having somewhere like this to bring my dogs on a daily basis has been a blessing! The dogs love it and I can go to work knowing they are cared for and happy. Karen and her team are simply wonderful. I can't recommend her highly enough!" - Lisa with Dylan and Daisy.